It was a special occasion when companions and guests of Bootle Chapter No 1473, gathered at Litherland Masonic Hall, to witness the installation of Simon Gray as their new first principal. For the installation the chapter was pleased and honoured to have Tony Hall, Assistant to the Provincial Grand Principals, as their principal guest. Pictured from left to right, are: Brian Meadows, Tony Hall, Simon Gray and Mike Melia. Tony was accompanied at the ceremony by the Ormskirk and Bootle Group Chairman Graham Chambers, the vice chairman Malcolm Alexander, with grand officer Ian Gee and the acting Provincial grand chapter officers. After the chapter was opened and initial chapter business had been completed the director of ceremonies, David Sullivan, announced that Tony Hall was without and requested admission. Tony was then brought into the temple in a procession, accompanied by Ian Gee, Graham Chambers, Malcolm Alexander and the acting Provincial officers, John Greenhalgh, David Coulson and Barry Dearden. 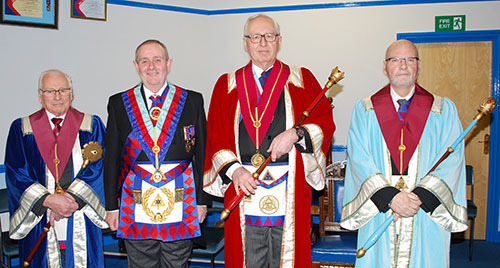 After Tony was warmly welcomed by the three principals to the chapter, the installation ceremony commenced with the second and third principals being temporary replaced for the ceremony. Mike Clarke continued as the first principal, Derek Challinor replaced Simon Gray as second principal and Brian Meadows replaced Ray Morris from Chorley Chapter No 6287, who was assisting the chapter by acting as third principal for the evening. Simon was then installed as the first principal by the outgoing first principal Mike and Mike Melia was then installed as third principal by Simon. The whole ceremony was under the expert direction of the chapter’s DC David Sullivan who carried out his duties with a high level of proficiency. The scarlet robe address was delivered by Russell Skidmore and the blue robe address was delivered by David Sullivan. Peter Whalley delivered the address to the first principal and after the appointment of the chapter’s officers, the address to the officers of the chapter was then given by Russell Skidmore, which was followed by the address to the companions of the chapter, which was delivered by Tony Hall, in his usual confident and superb manor. At the conclusion of the ceremony Tony brought greetings on behalf of the Grand Superintendent Tony Harrison, congratulating the three principals and all the members of the chapter for the enjoyable ceremony. Tony proceeded to give congratulations to Mike the outgoing first principal and Dave Sullivan the DC for their work during the evening and all the members of the chapter involved in the ceremony for their work that evening. Pictured seated from left to right, are: Brian Meadows, Simon Gray and Mike Melia, with Tony Hall and the grand officers together with acting Provincial grand officers assembled behind.